CBS finished in first place for the evening with a 7.9/12 household rating/share, 12.46 million viewers and a 4.1/10 rating/share among adults 18-49. 8:00 p.m.: The Big Bang Theory (6.7/10 HH rating/share, 10.80M viewers, 3.7/10 A18-49 rating/share). 8:30 p.m.: How I Met Your Mother (6.4/10 HH rating/share, 10.48M viewers, 4.2/11 A18-49 rating/share). 9:00 p.m.: Two and a Half Men (9.6/14 HH rating/share, 15.65M viewers, 5.2/13 A18-49 rating/share). 9:30 p.m.: Worst Week (6.8/10 HH rating/share, 10.60M viewers, 3.5/8 A18-49 rating/share). 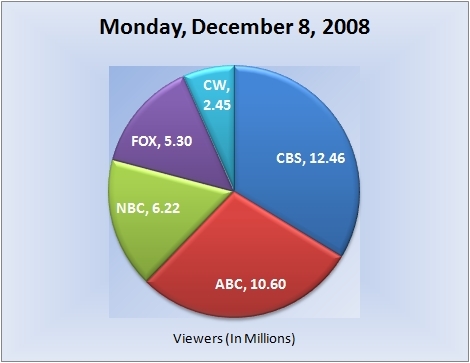 10:00 p.m.: CSI: Miami (8.8/14 HH rating/share, 13.62M viewers, 4.0/10 A18-49 rating/share) ended the night for CBS. ABC followed in second place for the evening with a 6.4/10 household rating/share, 10.60 million viewers and a 2.9/7 rating/share among adults 18-49. 8:00 p.m.: A Charlie Brown Christmas-REPEAT (6.3/10 HH rating/share, 11.37M viewers, 3.8/10 A18-49 rating/share). 9:00 p.m.: Boston Legal (6.2/9 HH rating/share, 9.91M viewers, 2.3/6 A18-49 rating/share). 10:00 p.m.: Another episode, the season/series finale, of Boston Legal (6.7/11 HH rating/share, 10.51M viewers, 2.6/7 A18-49 rating/share) ended the evening for ABC. NBC finished in third place for the evening with a 3.9/6 household rating/share, 6.22 million viewers and a 2.6/7 rating/share among adults 18-49. 8:00 p.m.: Chuck (4.4/7 HH rating/share, 6.93M viewers, 2.4/6 A18-49 rating/share). 9:00 p.m.: Heroes (4.7/7 HH rating/share, 7.78M viewers, 3.6/9 A18-49 rating/share). 10:00 (10:01) p.m.: My Own Worst Enemy (2.5/4 HH rating/share, 3.96M viewers, 1.8/5 A18-49 rating/share). FOX followed in fourth place for the evening with a 3.3/6 household rating/share, 5.30 million viewers and a 2.0/5 rating/share among adults 18-49. 8:00 p.m.: Terminator: The Sarah Connor Chronicles (3.4/5 HH rating/share, 5.21M viewers, 1.8/5 A18-49 rating/share). 9:00 p.m.: Prison Break (3.2/5 HH rating/share, 5.39M viewers, 2.1/5 A18-49 rating/share). The CW finished in fifth place for the evening with a 1.7/3 household rating/share, 2.45 million viewers and a 1.2/3 rating/share among adults 18-49. 8:00 p.m.: Gossip Girl (2.1/3 HH rating/share, 3.01M viewers, 1.5/4 A18-49 rating/share). 9:00 p.m.: Privileged (1.3/2 HH rating/share, 1.90M viewers, 1.0/2 A18-49 rating/share) ended the evening for The CW. Note: Network average numbers from the week prior are based on fast national data. Comparison’s from the week prior (or episode-to-episode, etc.) on specific shows are based on final national data. Ratings for the current day are based on fast nationals. (Expect all three scenarios to be the case at all times, unless otherwise noted). The final rating for first-run episodes that aired this evening will be reported the following week. So for example, the final rating for tonight’s episode of “Two and a Half Men“ will be reported in next weeks report for Monday, December 15, 2008.